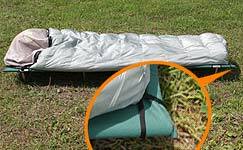 All-in-One - Your "every trip, every climate" sleeping bag! Testing is over, and the final prototype has been approved! The All-in-One is in production! It has all the features of the original AI-101, but now features removable insulation! Three different levels of liner will be available for your comfort. And now you can use just the shell for those hot summer nights! The outer shell is now Nomul1, which allows for better "breathing" in the summer, yet is more resistant to condensation in the winter. The insulation is still 900-fill of European White Duck Down, just like our original AI-101. Weight not available at this time. Tapered ends, hook-and-loop strap across the middle, and an adjustable cord at the top all secure the AI-101 to your mattress. You won't fall off, so you sleep all night! Built-in pillow case accomodates air pillows from Big Agnes, Cocoon, etc., as well as foam pads. 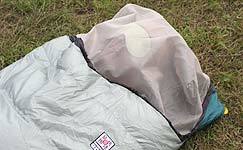 Lightweight net doesn't smother you, but keeps the bugs out. 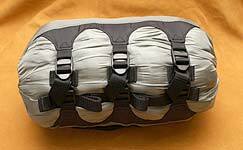 Handy loops hook on to cot, keeping you and the bag securely in place. 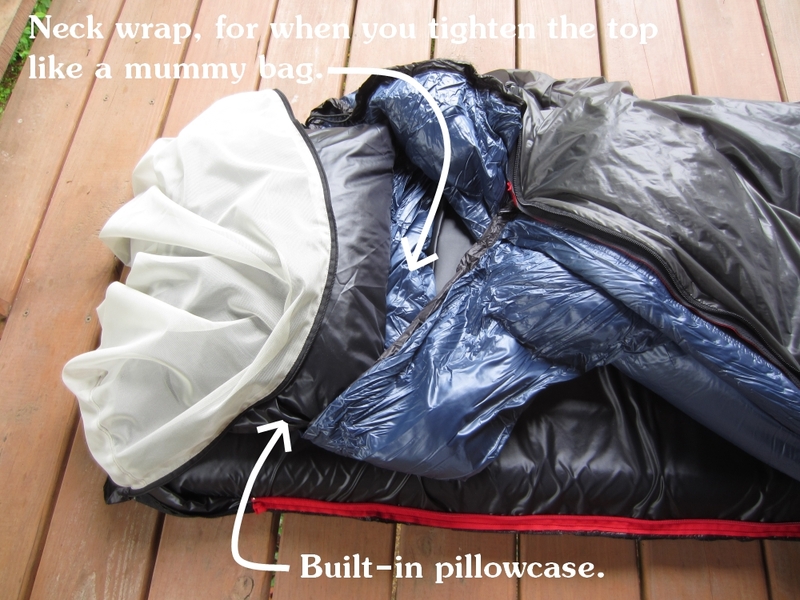 No more waking up in the middle of the night, tangled up with your sleeping bag. 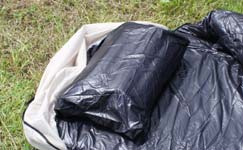 The AI-101 comes with its own stuff sack, but if you prefer, you can use our Smart Compressor Bag (shown here). 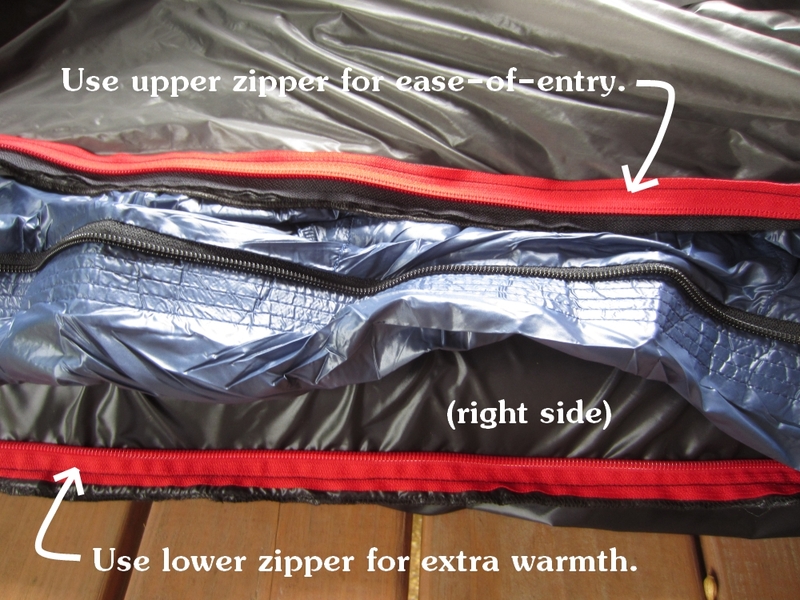 Our AI-101 sleeping bag has some very innovative features. 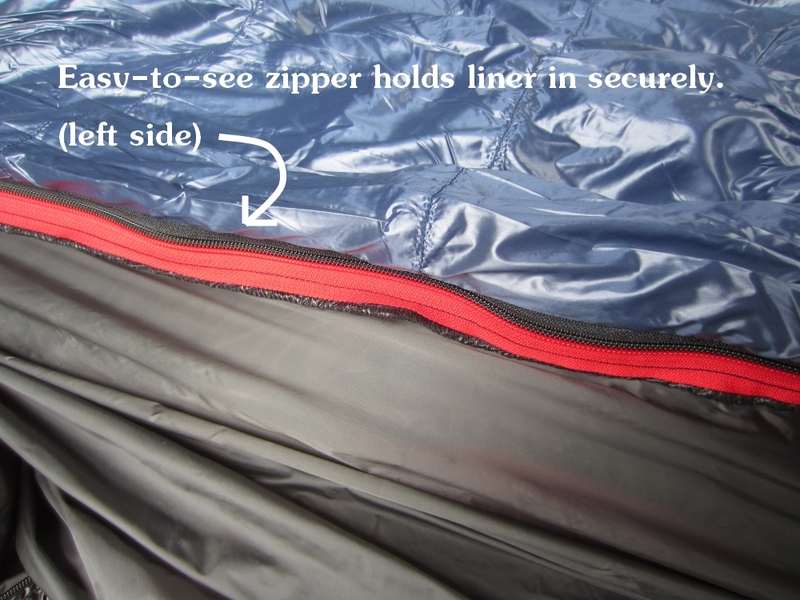 Most noticeable is the built-in mosquito net, giving you the option of sleeping outside without a tent. Don't want to use the net? It unzips and ties out of the way. 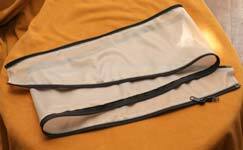 Other features include tapered corners and a hook-and-loop strap underneath for securing the sleeping bag to an inflatable mat, hooks for securing the bag to a cot, and a built-in pillowcase. 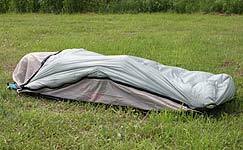 With a Nano-tex shell and down fill, it's good for 30-degree nights. Best of all, it packs into our Smart Compressor Bag just under 14" long! 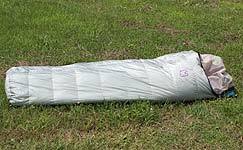 All AI-101 sleeping bags come with a 30-day satisfaction guarantee, and a lifetime warranty on workmanship. AI-101 American (long wide) size - NOW IN STOCK! Down: 300g - uses 78x26 pad or smaller. 1.8 lbs. Tennessee residents add 9.25% sales tax. 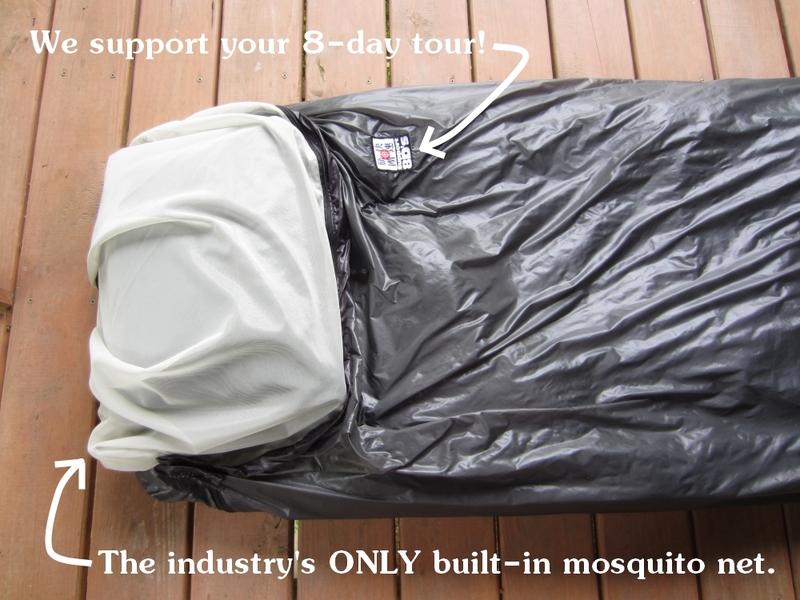 An optional extra for the AI-101 is this mosquito net for the side of the bag. 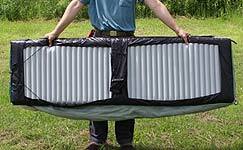 Great for when you need more room, or those warmer nights when you need a bit more air around you. AI-101 Side mosquito net - SOLD OUT! (Can be re-stocked from Japan and your order filled in a week.) Optional for the AI-101. Fits either size. Tennessee residents add 9.25% sales tax. A: The American size weighs just 1.8 pounds, while the Japanese size weighs just 1.6 pounds. Q: What is it rated to? A: It is not formally rated (yet), but they have been used comfortably in the low 30's. Basically, it is considered a 30-degree bag. A: European white duck down. Q: How waterproof is it? A: It's pretty good. Morning dew or a light drizzle is no problem. Q: Why do you use the terms "Japanese size" and "American size"?